In the store’s final salute to National Crochet Month, I’d like to share a terrific garment made by Connie Chisholm. 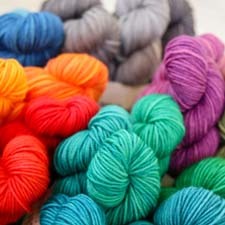 Connie states that she stopped by WEBS to pick up 10 skeins of Universal Yarn’s Classic Worsted Tapestry. 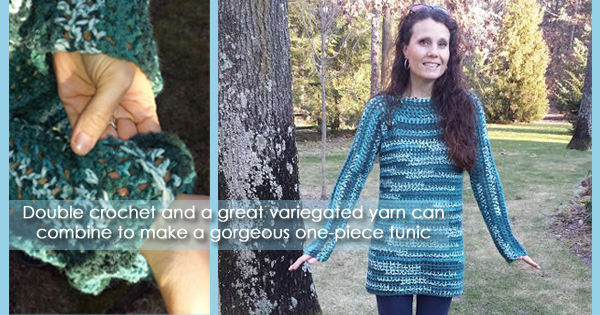 This yarn is no longer available, but using Universal’s Classic Worsted will yield the same beautiful results. Originally, her idea was to crochet an afghan. That plan evolved a few times and the final result is a tunic-length pullover which Connie designed herself using a double crochet stitch. You can read all the details about Connie’s first sweater on her Ravelry page. Connie says that she loves to crochet because it allows her to design creatively and that “all you need is an idea, patience and time to enjoy the process.” Connie’s garment clearly demonstrates her enthusiasm for crochet and her design skills too. Last week one of our local customers, Peggy, brought in a blanket she’s been working on for a friend. 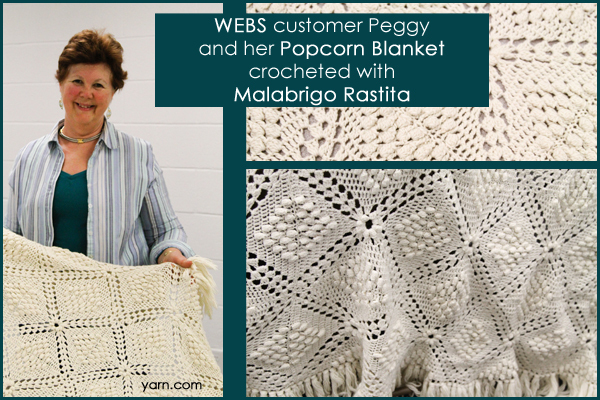 She says, “It is a very old pattern that my friend’s mother made for her many years ago. She has been searching for several years to find it.” The pattern was found, an old magazine clipping, and Peggy got to work. Thanks for bringing in this lovely blanket Peggy! And for those of you curious about the pattern, it was originally published in 1946 in the Complete Book of Crochet, but the pattern is available online as well. Have you taken on any large scale projects this year?